FORT SMITH (KFSM)--For eight straight seasons (2008-15), Jeff Williams and Southside won at least eight games. The last two years, the Mavericks have won six total. "We’re just ready to start popping. You know, we’ve had a bad two years the last two years and we’re ready to completely start over. Throw everything out and start over," senior Darin Davenport said. Davenport is a division one prospect at linebacker but has missed the past two seasons after a pair of torn ACL's. "It's huge having Darin back, he's definitely the bell cow of our defense," Williams said. Davenport is just one piece on a very speedy roster. "We’re probably as athletic as we’ve been on both sides of the ball," said Williams. "We can really run defensively and offense our skilled guys are very very good. We got all our secondary guys back and speed’s the name of the game, bottom line." Some of that speed starts with quarterback Taye Gatewood. The senior accounted for over 3,500 yards and 47 touchdowns last fall. "We have a lot of people that are fast, we’ve got a lot of speed on the outside," said Gatewood. "Just get faster, line up, more tempo, on the go." 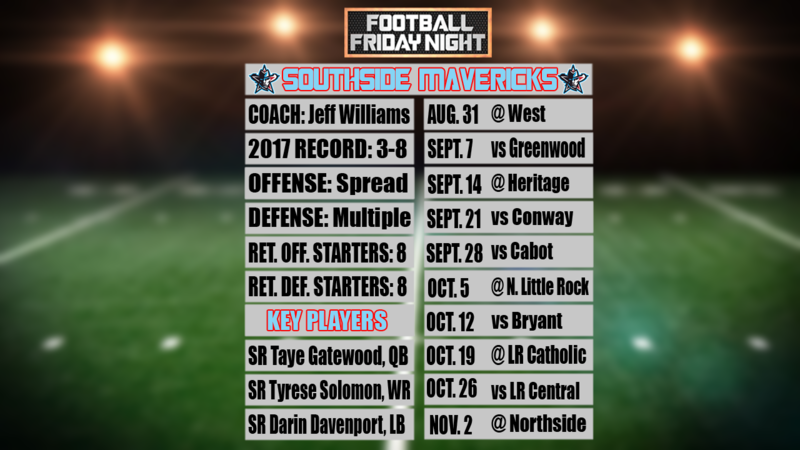 Last fall, Southside won two of its final three games to make the playoffs, before falling to Fayetteville in the first round. That late season momentum could spill over to 2018. "I’ve been doing this for 23 years, and the good teams get better as the year goes on and the teams that don’t have a very good year get worse as the year goes on," said Williams. "We’re very excited about our football team, got 16 starters back and a very senior oriented football team." Williams and Southside open Bentonville West's new stadium on August 31 before hosting defending 6A state champion Greenwood on September 7.